The Longest Photographic Exposure Ever Created Was Used To Capture? There are long photographic exposures, like the kind you use to capture star trails and canyons on moonlit nights, and then there are long exposures like the kind you use to capture the demolition and reconstruction of an entire building over years of redevelopment. In 2001, the Museum of Modern Art in New York City invited German photography artist Michael Wesely to bring his experience and equipment to bear on the redevelopment of the MoMa building. Wesely specializes in extremely long photographic exposures and wanted to capture the entire construction process in one ghostly long exposure. How long exactly? The shutter opened on September 8, 2001 and didn’t close again until July 6, 2004. That 34 month exposure outdid every previous exposure record (including those set by Wesley himself). The results, captured with eight large format cameras positioned in four corners around the construction site, provide a ghostly view of the building as a work in progress where you can look through the very beams of it to see the streets, buildings, and skyline beyond. 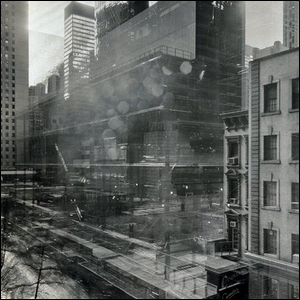 Image courtesy of Michael Wesely.